Make your pieces into the shapes shown. For the BODY roll a 1 1/4" ball of white into a cylinder. For the LEGS roll two 5/8" balls into smaller cylinders. (Each cylinder makes two legs.) For the HEAD roll a 3/4" ball and taper the top into a teardrop shape as shown. The EARS are two 1/2" balls flattened to 1/4" thick teardrops. The TAIL is made from a 1/4" ball made into a teardrop. The tuft of HAIR is made from a 3/8" ball flattened to 1/4" thickness and shaped into an oval. Press one small cylinder leg onto body as shown. Use the toothpick to indent a center line to divide front legs. Now make a line to indent the hooves. Follow the same instructions for the back legs. Let cool in oven. 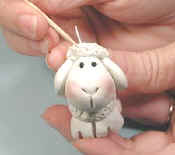 DO NOT bake at a hotter temperature or the white clay may burn or turn brown. When cool, tie the 8" ribbon around his neck and put the 10" ribbon through hanger and tie a knot. 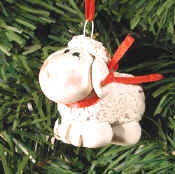 Your Christmas Lamb is ready for the tree or to give as a special gift. Get Joshua's Book, Hangin' Around With Noah.